Home?>?View All ?>? Diamonte applique. Dainty bows. 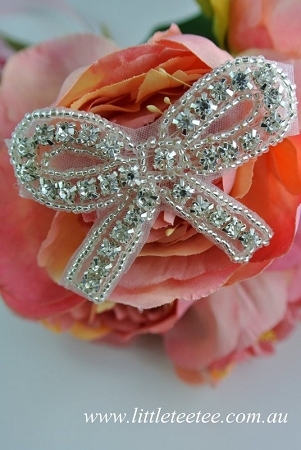 This bow-shaped applique featuring diamonte & delicate beading will create a stunning finishing touch to your creation. Perfect for bridal/special-occasion wear or for anyone wanting to add a beautiful detail on their outfit! These can also be used in scrapbooking & so many other craft mediums. Sew it, glue it or iron it on.